If you’re considering remodeling the basement of your Annapolis custom home, here are some ideas to inspire you. 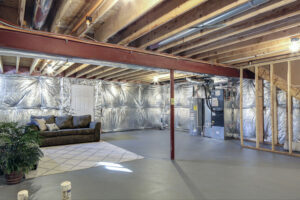 Finishing a basement is a fantastic way to add value to your home. When they’re unfinished, basements provide somewhat usable space, but no comfort. Most homebuyers today are expecting and looking for usable, comfortable, functional space in their basements, so choosing to finish your basement now will make your home more marketable in the future. If you’re considering remodeling the basement of your Annapolis custom home, here are some ideas to inspire you. Double the living room, double the relaxation by adding a second living room to your home and putting it in your finished basement. This space could be as simple as a comfy couch and a TV on the wall or as extravagant as a home theater set-up. Either way, you’re doubling the space that your family and guests can relax and unwind. There are lots of reasons that you could want or need a spare bedroom in your home. Perhaps you have an extended family, and you have house guests for much of the year. Or maybe your teen is getting too old to share a room with a younger sibling. Whatever the reason, the finished basement could provide the perfect space to design a new bedroom and some much-needed privacy. Another excellent use for a finished basement is a home gym. Instead of dragging yourself out in the cold to go to the gym, head downstairs. You can tailor the gym to precisely what you want and need, and you can use different flooring options to separate different work areas. You could even add that sauna that you’ve been dreaming of all your life. If you have enough space, the basement can be a great place to add a small apartment. All you need is space for a small bedroom, bathroom, relaxing space, and a kitchenette. This can be a wonderful place for college students to live till they get on their feet, for aging parents to move in, or to rent out for some added income. Another popular option is to turn the finished basement into the kids’ playroom, so all that loud, noisy play can be out from underfoot upstairs. Consider built-in toy storage, comfortable, kid-sized chairs and tables, and even play equipment like rock walls or slides.